Khans of Tarkir gave us A LOT of good multicolor cards. It was because of these cards that decks such as Abzan aggro, Mardu Midrange, and Temur Monsters were able to take off. In Fate Reforged, we didn’t get that many new multicolor cards, but what we did get was a lot of mono colored cards with multicolor abilities. This should figure into how the KTK cards are played in this new format. Just how will FRF affect this new standard? Well, we got a glimpse of what it could be like at SCG DC, but it looks like we’re going to have to wait a while before we see any large scale results. This weekend we have 2 limited GPs, and the weekend after that is a the Modern Pro Tour. PPTQ season is going to be in full swing and it looks like it’s going to be up to us normal folk to brew and see what works. This bodes well for MTG prices I think, as we have a lot more players testing the new format out instead of just jumping on what did well at a Pro Tour or Grand Prix. So just what might see some play in today’s categories? Let’s take a look. But first I’ll go over my picks from last time. Obelisk of Urd – The Obelisk didn’t move from its price of $1.25 in the USA since last time, but in Japan it doubled in most play and is about 300 yen now. Guess there are a few more aggro players here than overseas. Perilous Vault – I got really lucky with this one. I suggested that you invest in it at $3 if you planned on playing control, and if you did you saved a bundle. The card is currently going for $9. Phyrexian Revoker – No movement from the Revoker this time. Not a lot of activated abilities to worry about, so it’s not seeing any play. It went down from $1.50 to $1.25. Mana Confluence – I stated that it would hold around $17-18 until January, but it really had a falling out in standard due to all the midrange decks we had around, as well as the ubiquity of Sylvan Caryatid. It’s not at about $11.25. Nykthos, Shrine to Nyx – I didn’t recommend it last time, but I did say to keep an eye on it if Devotion made a come back. Didn’t last time, but might now. Iroas, God of Victory – Another wiff on my part. Theros block gods just didn’t get much love during Khans of Tarkir standard. I recommended him at $6, but now he’s at $4.50. Pharika, God of Affliction – I was right about Pharika seeing more play and matching up well in Sidisi. She saw a lot more play in Japan than overseas though, but nonetheless her value went up slightly from $4.50 to almost $5. She actually reached close to $8 at GB/Sidisi Whip’s peak about a month ago here in Nagoya. Reaper of the Wilds – I thought it would be a good card to match up against Siege Rhino with, but she lacked any synergy to be worth playing in any kind of GB deck. Another miss. Tymaret, the Murder King – Did the new version of Aristocrats take off? No. Did Tymaret increase in price? Nope. Multicolor choices were pretty hard last time, especially just a week or two into the new metagame, but I felt I did well on some key cards like Perilous Vault. I think Khans of Tarkir has developed the metagame nicely for the next few months though, and it will be much easier to see trends on which cards will see play and which won’t. Let’s take a look at my choices for the next 2 months. I’m going to start off with Ajani, Mentor of Heroes today. He’s quietly become one of the most expensive planeswalkers in standard at $18. I find it strange because I haven’t seen much of him at all. He’s in a few Abzan Planeswalker decks, as well as Naya Planeswalkers, but I can only surmise this is because of EDH. It seems like it would be good in that format, digging for cards you need. I don’t know how much play he’ll see in the next standard format, but I think $18 is a good peak price right now and I’d sell any I didn’t need. Another possiblity is that this price is attributed to supply and demand, which is all the more reason to get rid of him over the next few weeks before his prices starts to descend. There are also quite a few deals with KTK cards due to it being opened so much. I’d recommend buying into a lot of the staples while they are low so you can benefit when they go up later this summer. 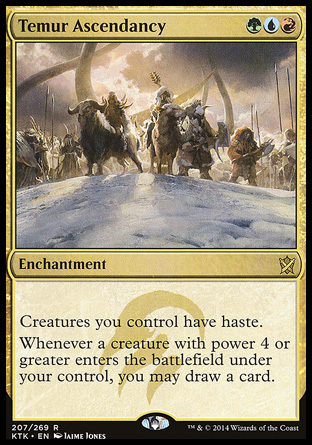 Right now, I think Butcher of the Horde ($1.75), Crackling Doom ($1.50), Mantis Rider ($1.50), Narset, Englightened Master ($1.75), Sagu Mauler ($.50), Savage Knuckleblade ($1.25), Rakshasa Deathdealer ($1), Utter End($1.50), and Surrak Dragonclaw ($1.50) are good deals. These cards are bound to double in price this summer, and you won’t get any lower prices than now. As I stated in my green article, the other week we saw a Temur Ascendancy Combo deck make both 65th and 11th place at the SCG DC Open, which opens the flood doors on a number of cards. While they might not be as popular as other decks in standard, there will definitely be a number of players trying out the deck or playing it as their deck this season. The card is currently around $.50, but from the casual demand alone I would consider putting this at closer to $1.50-$2 by the end of spring. Most places in Nagoya have already increased their prices to these levels. 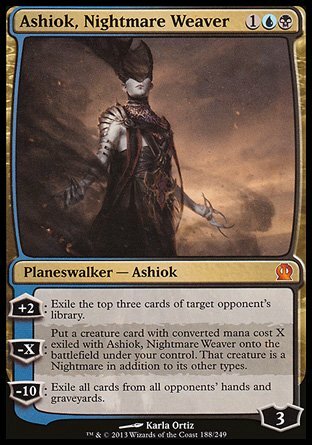 Ashiok, Nightmare Weaver ($11) also looks like he’s experiencing a spike right now. I expect him to hit about $13-$15 if UB control decks do well over the next few weeks, so if you have extras sitting around trade them away when the next spike hits. I think he’ll see a lot more play this spring. If you can still pick some up for around $8, it might be worth it. Aside from those staples, I don’t see too many other multicolor cards dropping in value or going up. Some of the gods in the Theros block will continue to inch down unless they see play in other formats such as Keranos, but most of the other multicolor cards such as Sidis, Brood Tyrant and Siege Rhino should hold their value this standard season. There aren’t too many regular lands to deal with at the moment, but I would like to point out Nykthos, Shrine to Nyx. It’s currently at $3, and if green devotion becomes popular it could shoot up. I don’t think it’s chances are that good of breaking out this standard, but it should see some play and raise in value to allow you to get rid of them at an acceptable price. Over the next 2 months, Pain Lands are going to reach their highest they ever have in this standard format. Fate Reforged gave us more quality mono-colored cards which means there might be an increase in 2 color decks this time around, and if that happens it means we’ll see an increase in demand for enemy pain lands. Battlefield Forge has reached an unheard $9, Llanowar Wastes is $6.50, Yavimaya Coast is $4.50, Caves of Koilos is about $2.50, and Shivan Reef is $7.50. Now I believe that Battlefield Forge, Shivan Reef, and Llanowar Wastes have already reached their peak. Unless you’re planning to make a 2 color deck in these colors, you should start profit making. I bought in on Forge at $2.50, and I plan on selling at least one now to get some of my investment back. Abzan saw its dominant time during KTK standard, so I don’t think Wastes will go up much more. As for Shivan Reef, its value is largely due to all of the Jeskai decks seeing play now. I also think it’s at its peak and will start letting go of my extras but keep 3. With Yavimaya Coast and Caves of Koilos, it’s a bit different. Temur Monsters, Sultai aggro/midrange, and even the Temur Ascendancy combo deck could push Coast above $5 this spring, so I would keep a close eye on it and not sell it just yet. The same could be true with Caves. Mardu decks, BW warriors, and BW midrange could be a popular strategy and double its value. You definitely want to hang on to those two cards now. With the Temples you want to be a little more aggressive in your trading/selling. 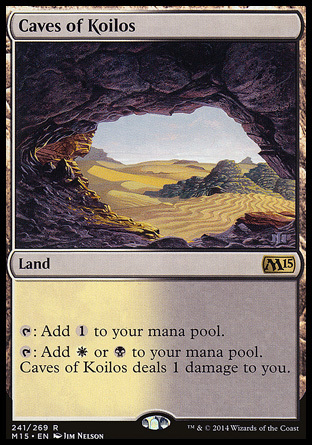 The Theros lands don’t have much juice left in them, but if you wait you might get some value out of them before they rotate. Basically, if you’re not playing control or a two color deck you don’t need 4 of them. I’d start to liquidate your Journey into Nyx and Born of the Gods lands over the next few months. Temple of Malady is currently $10.25 and I just don’t see that as being sustainable if Abzan can’t maintain its position at the top of the meta. Temple of Epiphany ($8.75) is another card I’d start to let go of and just keep 2-3 of. Temple of Enlightenment ($6) might be another card getting rid of as well. Sure these cards might be useful down the line, but as soon as everybody starts to abandon ship they are going to plummet in price. Nobody will use these cards in modern or legacy afterwards, not even as a poor man’s dual/shockland. The Theros lands are all pretty much rock bottom now, but you might be able to make some cash off of Temple of Deceit if UB control takes off. Once it hits $3-$3.50 I’d probably sell/trade it. Temple of Triumph ($4.75) is another card I’ll be looking to sell in the next month or two. We won’t see a bottom to the fetches for another month or so. I would probably be holding onto to any extras if you don’t need the cash, and wait for spikes where you could unload them. If you’re looking for long term investments, it won’t be a bad idea to start picking up any that somehow get below $10. Bloodstained Mire is close ($10.25), and Wooded Foothills isn’t too far behind it ($11.25). I’d also be picking up any of the blue ones for $12-13 if I can find them at that price. There aren’t too many exciting artifacts to invest in this time around. Perilous Vault ($9) should maintain its value through the spring, and I don’t really see Phyrexian Revoker ($1.50) doing anything this season either. Obelisk of Urd ($1.25) still holds the potential to see a spike with Warrior/Soldier decks, but I think the 2 cards most likely to see any kind of play in any format are Ghostfire Blade and Scuttling Doom Engine. I’ve been using Ghostfire Blade ($.50) in my modern affinity deck and it has worked out rather well. Depending on how many people pick up Affinity after the Pro Tour and after the Modern Masters 2 GP in May, the deck could see a decent spike in value. Get a playset for $2 and you won’t be sorry. Scuttling Doom Engine ($1.50) also seems like a good pick up for its value. I could see it being played in other formats in the future like EDH. That does it for this seasons Bang for your Buck articles. How did you do with your picks last season and what cards you choosing for the Fate Reforged season? Feel free to leave your picks down below with a short explanation, I’d like to hear them. Now that the season is underway, I look forward to reporting on the metagame here in Nagoya/Japan again as I prepare for the PPTQ season in February and March. There is still lots of content coming your way here on The Japan Hobbyist.com, so be sure to check back in a few days! Thanks for reading.